At the same time, Bezos became enamored with a book called Creation, by Steve Grand, the developer of a 1990s video game called Creatures that allowed players to guide and nurture a seemingly intelligent organism on their computer screens. Grand wrote that his approach to creating intelligent life was to focus on designing simple computational building blocks, called primitives, and then sit back and watch surprising behaviors emerge. The book…helped to crystallize the debate over the problems with the company’s own infrastructure. If Amazon wanted to stimulate creativity among its developers, it shouldn’t try to guess what kind of services they might want; such guesses would be based on patterns of the past. Instead, it should be creating primitives — the building blocks of computing — and then getting out of the way. In other words, it needed to break its infrastructure down into the smallest, simplest atomic components and allow developers to freely access them with as much flexibility as possible. It was, and nearly every startup of note to be founded in the last several years has started on AWS or one of its competitors. The true measure of AWS’ impact, though, was the way it transformed the ecosystem around developers, including venture capital. 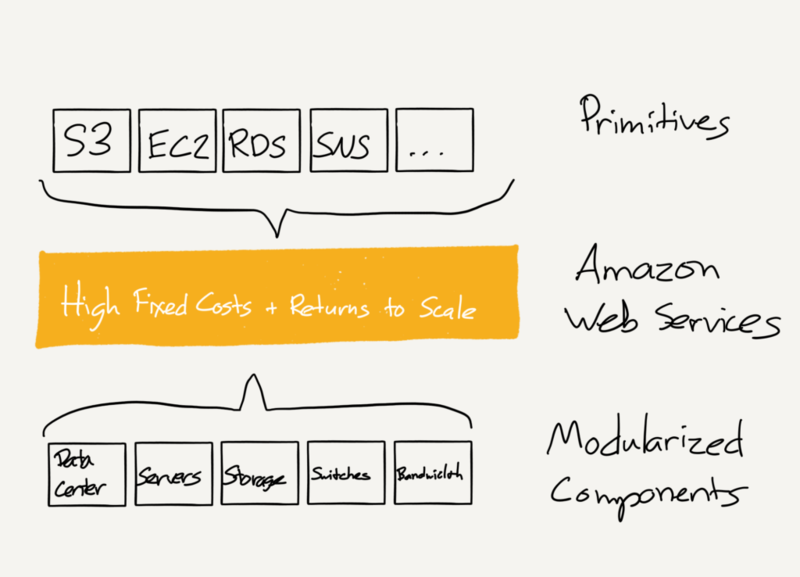 The monopoly Palihapitiya is referring to is based on the scale effects I noted above: the larger AWS becomes, the greater advantage Amazon has in pricing AWS’ services, which means they can earn ever more business, which increases their advantage even more. The net result is that for all but the largest cloud-based companies3 this advantage, combined with the flexibility AWS affords (which is critical both operationally and financially), will lead to the inevitable conclusion that Amazon ought to service all their infrastructure needs; the payments they make for this service are Palihapitiya’s “tax”. What is worth considering, though, is the possibility that just as AWS’ effect on developers spread out into the broader startup ecosystem, it increasingly seems that AWS’ impact on Amazon itself goes far beyond its already substantial contribution to the bottom line. 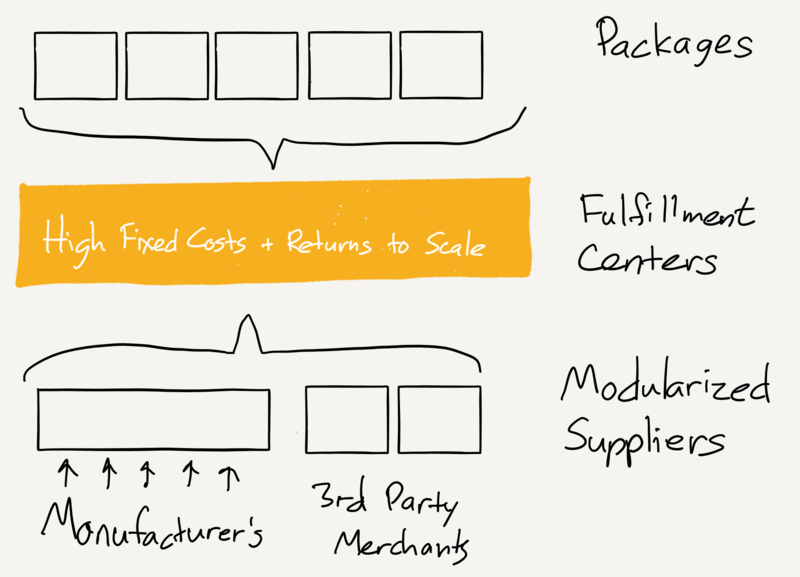 Amazon may have started as, to use Stone’s title, “The Everything Store,” but its future is to be a tax collector for a whole host of industries that benefit from the economies of scale, and AWS is the model. What, though, if Amazon is content with making no margin on the sale of “Electronics and General Merchandise”? I don’t mean this in the Mathew Yglesias sense, that Amazon “is a charitable organization being run by elements of the investment community for the benefit of consumers”; rather, what if the business model of Amazon’s e-commerce business has changed to “tax” collection? Consider Costco: last year the wholesale retailer had net income of $2.3 billion on sales of $114 billion to its over 81 million members; the total sum of membership fees was $2.5 billion. In other words, Costco’s 11% gross margin didn’t even quite cover the cost of running the business; the difference, along with all of the profit, came from a “tax” levied on Costco customers. I would contend Prime memberships play the same role for Amazon: the non-AWS parts of the business last year generated $2.6 billion in operating profit;6 meanwhile, Consumer Intelligent Research Partners (CIRP) estimates that Amazon now has 54 million Prime members, which at $99/member would generate $5.3 billion in revenue; the difference in profitability for Amazon’s e-commerce business, such as it is, comes from a “tax” levied on Amazon’s best customers. In fact, though, I think even this analysis is too narrow: e-commerce is inexorably taking over more and more of the U.S. retail sector in particular, and Amazon is taking over 50% of that e-commerce growth. Combine this reality with the growth in Prime and Amazon is effectively on its way towards collecting a tax on all of retail. The “tax” analogy extends beyond Prime; for example, Amazon is taking a portion of these 3rd-party sales, and a greater portion of revenue from goods they sell directly. The effect, though, is consistent: Amazon is collecting a “tax” on a massive industry and no one minds because Amazon’s scale ensures the best prices and the best experience. In a securities filing, Amazon for the first time identified “companies that provide fulfillment and logistics services for themselves or for third parties, whether online or offline” as competition. And it referred to itself as a “transportation service provider.” In both cases, it marked the first time Amazon included such language in its annual report, known as a 10-K.
Well, start with the fact that Amazon itself would be this logistics network’s first-and-best customer, just as was the case with AWS. This justifies the massive expenditure necessary to build out a logistics network that competes with UPS, Fedex, et al, and most outlets are framing these moves as a way for Amazon to rein in shipping costs and improve reliability, especially around the holidays. The much-buzzed about Echo fits this model too: all of the usual suspects can build out the various pieces of the connected home; Amazon will simply provide the linchpin, the Echo’s cost a “tax” on the connected home. The stronger our market leadership, the more powerful our economic model. Market leadership can translate directly to higher revenue, higher profitability, greater capital velocity, and correspondingly stronger returns on invested capital…we choose to prioritize growth because we believe that scale is central to achieving the potential of our business model. Previous post: Exponent Podcast: Is That an Echo?